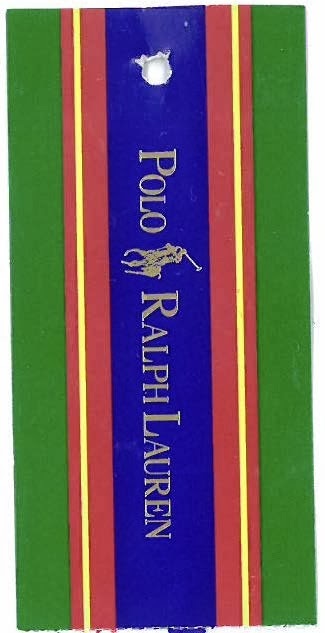 This is another hang tag from luxury design house Polo Ralph Lauren. There is quite a contrast between the two, as the previous was solid colors. This one uses bold, well saturated primary colors in horizontal stripes. Green, red, and blue make up the main colors, with a yellow accent and gold lettering. The design likely is calling to mind yachting flags. The gold foil used on the name almost looks cheap, but not quite. The reverse is department store clearance rack. There is a glaring typography issue with style name “CLASSIC05.” It screams mass market in the worst way possible, as does the “Return Label” text near the Macy’s name. There is good web address use here. When your web address is different than the company name, adding it to the reverse is a appropriate. Nicely done. I like this tag a lot. It has a simple design that speaks volumes about the product. Clean and sharp, it says old money country club luxury with a few colors. It is a shame the reverse wasn’t designed as well, but this one ranks highly in my book.